Using a screwdriver, disengage the claws and remove the seat side table leg cover. Remove the 4 nuts and seat side table. Remove the 2 clips and seat side table cover. Using a scraper, disengage the claws and remove the vertical seat adjuster knob cover. Remove the screw and the vertical seat adjuster knob. 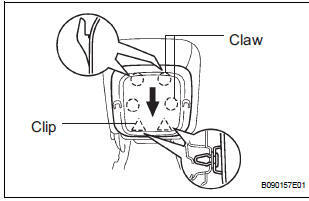 Using a screwdriver, disengage the claws and remove the reclining adjuster release handle. Using a screwdriver, disengage the claws and remove the cushion shield. Remove the nut and inner belt assembly. Remove the clip, 2 screws and seat track cover front outer. Remove the clip, 2 screws and seat track cover front inner. Using a screwdriver, remove the armrest cap. Remove the bolt and armrest. Remove the 2 washers and 2 spacers. Disengage the clamps and hooks. Disengage the hooks and remove the seat cushion cover with pad. Remove the hog rings and the separate type front seat cushion cover. Remove the seatback board by pulling it out in the arrow mark direction shown in the illustration. Using a shop rag, remove the snap ring and lumbar support knob. Disengage the claw and remove the 2 headrest supports. 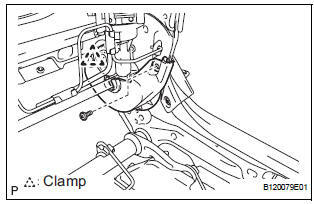 with Side airbag: Remove the nut and disengage the separate type front seatback cover bracket. Remove the hog rings and disengage the hooks. Remove the seatback cover with pad. Remove the hog rings and the front seatback cover. Remove the screw and the reclining adjuster inside cover LH (lower). HINT: Use the same procedures for the RH side and LH side. Remove the screw and the reclining adjuster inside cover LH (upper). Remove the screw and the front seat cushion shield lower LH.